Eileen Verata and her family were facing homelessness when they managed to find temporary accommodation with Tauranga trust Te Tuinga Whanau. So when the National Party social housing roadshow hit the Bay of Plenty town on Saturday to announce another 220 social houses for Tauranga, Verata was ready to go to bat for the trust, which needs more funding. But the heavily pregnant Verata's plans were derailed by contractions not long after she started talking to the visiting MPs. Associate Minister for Social Housing Alfred Ngaro was in Tauranga to announce housing to be built in the area. Te Tuinga Whanau operates five transitional houses in Tauranga where people can stay for 12 weeks at a time before moving into state or private rentals. More than one family can occupy each house. Verata was addressing MP for Tauranga Simon Bridges, MP for Bay of Plenty Todd Muller and Associate Minister for Social Housing Alfred Ngaro about how the trust has helped her family. 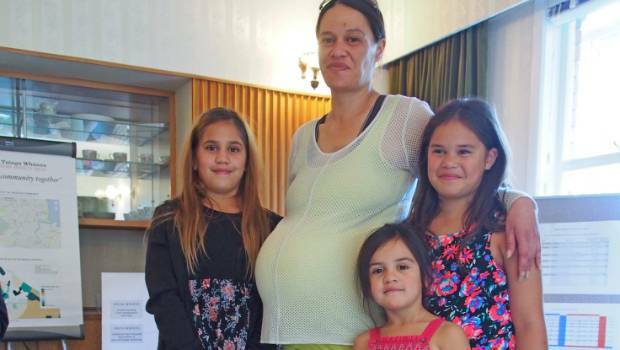 The MPs were making their social housing announcement at one of the trust's homes in Gate Pa.
Eileen Verata's family are living in temporary housing operated by Te Tuinga Whanau Trust in Tauranga. She is seen here with three of her four children, from left, Bowen, Karn and Laylah. Verata was urging the MPs to provide more funds for similar housing - and it was probably the first time National gave so much respect to someone from "labour". The trust's transitional homes currently host 19 adults and 39 children, which is to become 40 momentarily, thanks to Verata. Chairman of Te Tuinga Whanau trust Dr Bruce Bryant said that while it is encouraging more social housing will be made available, additional funding was required for current providers. "What worries me is the funding doesn't pay the bills," he said. 'We get about $240,000 of funding a year from Child, Youth and Family [now the Ministry for Vulnerable Children - Oranga Tamariki] and that is to do five interventions a week. We're currently doing 80 a week. An intervention is helping out anyone who knocks on our door and has nowhere to go or has suffered a bit of damage. "We're tasked with doing 260 a year and we're doing more than 4000." Bryant said the service really needs $600,000 a year to continue to operate, as stress on staff has become an issue. "We have 26 pay cycles a year and for about eight of those we have been apprehensive if we can put the payroll in," he said. "One day a senior staff member had to put in $10,000 just so we could meet the payroll. "I am sure after today we are being listened to." Te Tuinga Whanau Trust has four houses in Tauranga and Ngaro opened the fifth house, called Potae Whare on Devonport Road, which can cater for another two families. It will also be Eileen Verata's baby's first home for at least another eight weeks before hopefully finding a permanent place to live. Ngaro said National is committed to building 220 social and transitional houses in the Tauranga area over the next year in a bid to help families like the Veratas. "That will consist of 150 social houses and 68 transitional houses," he said. "There are 21 secured at the moment as part of the 68. Transitional homes are slightly different from social housing as it is temporary - for a 12-week period. "We will have capacity to help 272 people when you think about the capacity and the 12-week cycle." Social Housing Minister Amy Adams said that, across the wider Bay of Plenty region, National will provide 146 transitional houses to assist more families. "These houses are in addition to the 290 social houses we're planning to secure in the Bay of Plenty," she said. "These new properties will be a welcome addition to the region, which is an area of growing need." Verata, who retired from the announcement pretty quickly after labour began, will be glad to hear that. "We worried we would have baby living in a car," she said, but then the trust came to her rescue. Her four children mingle with other children in the house. Adults and children, including Verata's partner, who's recently found a job in the area, eat together as a family, watch television and do their homework in groups. It truly is a typical Kiwi house, she says, just shared with other families. "I've been here for about three or four weeks and everyone is really kind and caring. "It's given more stability for the children, as they can stay in their school and not be disrupted."